Just two or three decades ago, the web was considered a fringe tool for students and campus faculty members. Only a small percentage of the population owned a personal computer, let alone a web connection. The only practical applications were restricted, and overall, the entire PC scene was in its larval stage. As its popularity grew, the internet slowly started to become more than just an attraction for tech junkies. Suddenly, an entire generation of kids grew up on PC games, and the IT field started employing thousands of people. This may not seem like much, but it laid the groundwork for a tech-driven future. As a businessman, you used to rely on business cards, word of mouth, or conventional media such as newspapers, magazines, and TV, to spread awareness regarding your business. Only a few businesses actually considered starting a website, and even those that did still considered it to be mostly a gimmick. However, any respectable business in modern times wouldn’t even consider the option of not having a web page. Even smaller companies that target their local community found that it was advantageous to have an online portal that represented their product of service. It has gotten to the point where a website is an amalgamation of all the previous media, compacted into a comfortable form. It can feature newspaper-like articles, testimonials and reviews from customers, and all of the pictures and videos that the customers can handle. From a financial standpoint, this service is dirt cheap. A commercial aired on times of peak audience viewership can cost tens, if not hundreds of thousands of dollars. Even then you can get a maximum of 1-2 million views depending on the show. If you invest in a successful web page, you will gain access to an international audience. In addition to that broadened viewership, web pages can be optimized, so they can show up higher on search engine rankings. The amount of exposure that you can gain from the web is enormous, especially when you compare it to the amount of money that you spend. A local construction company may not need a large amount of international attention, but the search engine optimization is very important. After the decision to set up a website is made, the user needs to pick a viable hosting platform. Over the years, WordPress has become the sweetheart of the online community, as it offers an affordable and versatile service. Countless blogs and company web pages were established here, with more popping up every single day. These large numbers also come with a disadvantage: you risk getting lost in a crowd. Jevelin is the perfect theme for webmasters looking to establish an online home for their businesses and projects. Construction companies are particularly well served by Jevelin’s ample offering of features and layouts, which include dedicated demos, convenient shortcodes for introducing your staff, service packages and pricing plans effortlessly to the world at large. Jevelin is packed with gorgeous portfolio layouts and customization settings as well, which empower you to showcase your finest built works and your professional portfolio of constructional capabilities in a sleek and enticing presentation filled with custom animations, engaging transitions and even full-fledged online commercial features for you to sell your services right off your Jevelin website. Try Jevelin now! TheGem is a robust and reliable, tech-savvy and very intuitive, fast-loading and modern, highly responsive WordPress creative multipurpose website theme. TheGem is a high performance WordPress theme designed for professional, high-end applications that are exceedingly demanding in terms of quality and final polish. TheGem has been packaged along with over forty conceptually unique demo website templates that span a range of industries and businesses across all sectors, though it particularly shines when it comes to the construction industry. With several dedicated Construction demo websites as well as dedicated template pages styled to match, TheGem is a natural when it comes to showcasing your built works in an enticing way. Numerous options for both single page and multipage construction websites are available, including customized gallery settings and layouts, widgetized headers, footers and sidebars with a vast collection of useful widgets, handy shortcodes that make short work of your Pricing Plans, Service Packages and all similar information dissemination in an attractive presentation, and far more under the hood. With TheGem, you get a fully functional online shop page where you can directly market your services to the world at large, the same day you set up. Try TheGem today, and see for yourself! It works for large companies but also for small rising businesses. It is a versatile option for a professional normally overlooked. It gives you a 5 stars support team to complement with constant free updates. Industrial has many shortcodes to avoid coding requirement for building. It also uses WooCommerce for purchases and shop settings of all kinds. Get started on this great theme and try out its child theme too. Play along with menus and headers that are easy to modify. Industrial features a special cost calculator to make personal and clients’ budgets. It uses Native WordPress Customizer and it is WPML compatible. Go on and try this theme thought for your business specific needs…Go for Industrial! Visual customization is easy, due to the limitless amount of colors available. Users are able to design a site that fits their vision. Construction theme is translation and multilingual ready thanks to its built in WPML plugin support. This will facilitate your site’s growth, given that multilingual pages attract more views. If you have any questions, be sure to contact customer support. Their representatives are well-mannered and eager to help you. This theme is integrated with Revolution Slider, and it incorporates 15 HTML files. In addition, 11 PSD files are included. There are 6 distinct post types: Services, Clients, Projects, Staff, Slider, and Testimonials. This will facilitate the categorization of your content. Construction has 9 widgets with multiple widget areas, and a practical Drop-down Menu. You can expect many theme upgrades in the future. Construction is the right theme if you are looking for professional and easy to use the theme for your business. Real Factory is a modern and sophisticated, competent and capable, intuitive and easy to use, readily responsive WordPress factory, industrial and construction website theme. Real Factory is a dedicated website building toolkit aimed specifically and the industrial sector, with a myriad professional tools tweaked specifically for optimized functionality for corporations in the industrial, factory and construction businesses. With tons of advanced configuration options and an intuitive visual interface, you can easily set up your company website within minutes without even seeing a line of code. Dozens of header styles, footer options, limitless sidebars and handsome color styling combinations are all at your fingertips. Advanced theme customization settings, specifically targeted demo websites for different industries, and the amazing GoodLayers page builder make for one of the strongest, most intuitively customizable themes out there today. Blog layouts, gallery layouts, gorgeous HTML5 Genius wrapper system, portfolio layouts, WooCommerce ready online shops, and utterly mobile friendly, responsive visual style make Real Factory a stunning sight from day one. Useful predesigned pages and convenient widgets are available for you, including staff pages, product catalogues, handsome slideshows and advanced search engine optimization round off this potent industrial theme. Try Real Factory today, and make a dent! TheBuilt is a clean cut and aesthetically attractive, highly functional and very easy to use, tech-savvy and responsive WordPress construction, architecture and building business website theme. TheBuilt is a wholly inclusive WordPress website theme designed to meet and exceed the expectations of business webmasters in the architectural, construction and building sectors and industries with ease and effortlessness, while offering a broad range of tools to conduct your business online with. Wish is a powerfully resourceful and impressively thoroughly developed, thought out and detail oriented, technologically cutting edge and handsomely animated, seamlessly fluid and astoundingly easy to customize, user-friendly and intuitively navigable, robust and reliable, lightweight and responsive WordPress multiconcept, multipurpose website theme. 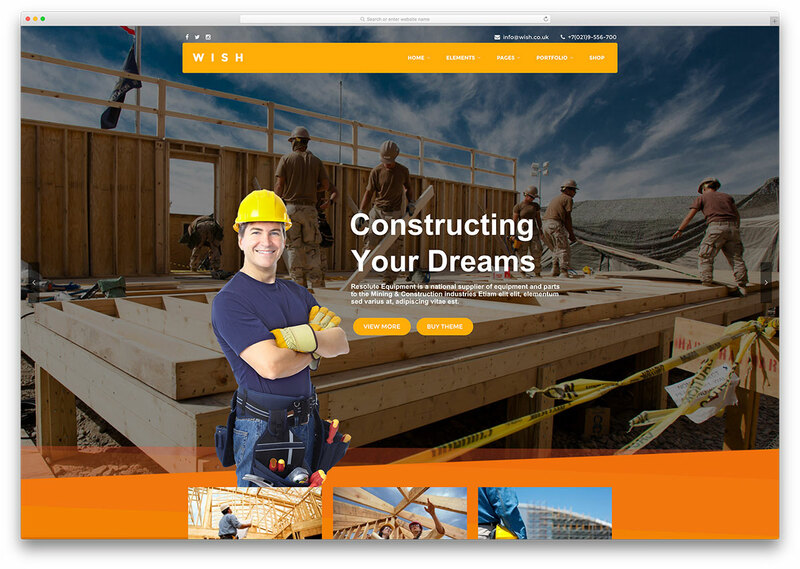 Wish is an ambitiously crafted website building platform, a theme that goes above and beyond the needs and expectations of webmasters rookie and seasoned alike. That is because Wish is based on the latest and greatest web development technological platforms, incorporating HTML5 and CSS3 coding, AJAX and Bootstrap deployment in seamless, subtle applications, and centers the website, page and layout design, edition and customization around the premium and included Visual Composer and Revolution Slider plugins, greatly enhanced with over 50 unique, in-house developed elements that are highly convenient and time-saving, including Pricing Plans, Staff, informative blurbs, tons of Contact Form capabilities,a plethora of on-point predesigned pages for specific business purposes and native, full integration of the WooCommerce e-Commerce plugin suite, making your Wish website also your online store the same day you install Wish! Wish is particularly popular in the construction, architecture, and landscaping trades, due to its capacity for showcasing professional galleries and portfolios with enticing, elegant sheen. This is your Wish come true! It would be hard to find a WordPress theme that can match the quality of Tower. This innovative product simply refuses to be mediocre, promising to enhance every aspect of your website. It features a very heavy focus on accessibility, given that anyone can simply create an amazing web page. The layout is responsive, and it is available in both Wide and Boxed variations. Your content will easy change and adapt in order to fit mobile device screens. This assures that customers can access your page while on the move. Jaw-dropping CSS3 animations were implemented, in addition to several Font Icon Options. The Live WordPress customizer tool guarantees that the site owners can alter any setting. In addition, the changes can be previewed before they are saved. This guarantees instant feedback, helping to guide your artistic direction. Tower has multiple post formats and a Revolution Slider plugin. Users are also able to influence the width of their site, without having to touch a single line of code. Professional support representatives offer to resolve any future issues. This is an authentic multi-purpose theme, considering that it can accommodate websites from any niche. Regardless of your business plan, Tower can be your greatest ally. When you primary means of income involves cleanliness, you must be sure that your WordPress theme is capable of reflecting the high standards that your customers expect. Although this theme has enough versatility in order to accommodate any site, it is best suited for the web page of general service companies, maid service companies, and maintenance companies. The tools, features, and plugins that were incorporated here, are enough to guarantee a website launch that is free of any issues. The developers take pride in the user-friendly properties of their product. No special training or distinct knowledge is required. Basically, if you can use a standard computer, you can set up your website. For more information, you can also check out their live preview and screenshots, items which will help you decide if this theme is right for you. Of course, ease of access and the impression of simplicity is what makes a program or skin, easy to use. Cleanco achieves this by integrating their custom portfolio and post options, along with their visual layout building tool, in one place. Being an individual architect or working for an architecture company is definitely one of the most rewarding occupations in the world. However, every single aspect of your business must represent the quality of your service, inspiring clients to trust in your expertise. This includes your website, and Arkitekt great theme for this specific niche, as it includes all of the plugins and features that are required for a great online company profile. It is WPML compatible, so you have the option of installing language plugins, effectively targeting demographics and customer bases that would otherwise be out of your reach due to the language barrier. However, even if your theme is translated, that offers no guarantee that your site will reach a lot of people. It all depends on the calculations of search engines. Thankfully, Arkitekt uses search engine optimization, a method of researching and integrating specific structure and keywords into the web page, greatly increasing your chances of getting noticed. Also, page content has been known to struggle when it is shown on mobile device screens. Reconstruction is programmed to avoid that issue, allowing for seamless transitions between multiple mediums, devices, and even browser types. The display functions are also retina ready, allowing for the integration of crisp, high-resolution icons. Many of the skin’s major features can be sampled, thanks to the live preview that was made available. It should also be mentioned that Reconstruction was developed by an elite author. Avanter is a great WordPress theme that has enough versatility to accommodate any page, but it is best suited for architecture and corporate sites. If you are just starting out and you want to sell your product or service, you must encourage buyers by offering them a safe and reliable environment for your transactions. Thankfully, Avanter has included the popular Woocommerce plugin, allowing for easy commercialization. Most WordPress themes use this plugin, so you won’t have many compatibility issues. The color customization spectrum is very broad, letting you express your inner artist. Who says that corporate site can’t have a little life injected into their design? All it takes is some tasteful and strategic use of the existing palettes, to increase the appeal of your company web page. A truly successful company will undoubtedly expand towards a broader, international audience. However, you must find a solution for the language barrier, which often results in secondary pages for your content. Why set up an entirely new web page, when you can simply have Avanter translate all of your existing stuff? Indeed, this theme can translate any website into any language thanks to its innovate plugins. The retina ready display guarantees that high-resolution icons are compatible with mobile device screens, and the responsive layout virtually eliminates re-sizing issues. When it comes to construction WordPress themes, this is as good as it gets. Designed specifically for this niche, every single one of its features is aimed at increasing efficiency and improving the potential customer’s viewing experience. You don’t have to believe anything, as the programmers have introduced two distinct sampling options. First, we have a live demo represented by a website that has already installed Apex. Second, the customers can see all of the back-end options, thanks to a tool that lets you create a test site. If these are not enough, you can always contact their informative support system. Their well trained, helpful representatives will solve any issue, and answer any question. The developers take pride in their high-performance Foundation framework, and the fast loading times that their theme offers. Multiple organization options are offered, with the distinct Property post category. This is a unique category that is separate from the standard posts that other themes offer. The property pages themselves will be a multimedia treat, as they will allow you to organize the profile of a specific property. This will include videos, images, and even a map route that will give you all of the information that you need. Widgets litter the front page, as every single inch can be modified or moved around. You can do whatever you like, because the innovative technology of this theme grants you that ability. Use it wisely and create a page that is sure to attract plenty of interested customers. The secret to a good WordPress theme is to make a skin that highlights the user’s work. It’s not about flexing your development muscles and cramming the theme full with features. You must find and select the features, plugins, and widgets that can help promote your client’s service or product. This is what distinguishes a great theme from a bad one: the ability to recognize which elements work best for each professional niche. Thankfully, Builder’s name is well deserved, as it is obvious that the developers knew what they were doing. The creators have added an option to filter your portfolio with beautifully animated effects, and they have packed your content will plenty of button shortcodes. If you are busy and you don’t have that much time for customization, there are some tried and true built-in templates that were included in your page. Even the writing can be customized, as Builder includes many variations of Google Web fonts. If a particular post deserves or requires a multimedia addition, this theme has you covered. The developers have added video support, allowing you to include or embed videos from another preferred site. Following the rise in popularity of tables and smart mobile phones, websites had to adapt to the changing environment. The basic programming infrastructure of any page had to accommodate the needs of smaller screens, without sacrificing speed or clarity. Avada is fully responsive, as it has the ability to adapt to any device. The sheer variety and complexity of its features make it ideal for almost any type of situation or website. If themes had royalty, this would be it, as it is the best-selling WordPress skin in history. With other themes barely reaching triple digits in their sales numbers, Avada was downloaded over 98,000 times. All of those people can’t be wrong! Although there are plenty of minute details that contribute to this theme’s success, it all boils down to a few core features. First, we have the powerful customization tools, with results in a limitless potential for design options. If you can imagine it, you can do it. The adaptability of the page also comes into play. The customer wants to be sure that his earned money has purchased a theme that can be viewed by all users of his consumer base. In addition to these features, the excellent support network, and the user-friendly interface must also be considered. Overall, this is a product that transcends mediocrity. Part of the credit goes to the very user-friendly admin panel. It’s so easy to navigate that even a child can create a nice-looking page. Once you decide to purchase this very affordable theme, you will also benefit from a lifetime of free updates and support features. The sleek, modern design does well to compliment the responsive and retina ready layout. There are limitless options for modification and improvement, brought to you by an intuitive and easy to use interface. Overall, this theme is one of the best out there, worthy of your attention. BeTheme can work with most browsers and its range of applications is truly staggering. In order to demonstrate this, free demos were added. Their sample websites range from school pages to modeling agencies, furniture stores and Construction company profiles. Be it architectures firms, barbers or babysitters, this theme can help you setup a great website. The price of this skin is very reasonable, and the user impressions are mostly positive. The simple fact that BeTheme has reached its 5.4 version and implemented over 60 demos proves that the developers were not just looking for quick cash out. The list of features is overwhelming, too long to list here. However, what you need to know as a customer is that BeTheme can give you access to every tool in the web developer’s arsenal, maximizing your chances of getting noticed, and attracting plenty of clients.